Izzy loves art! 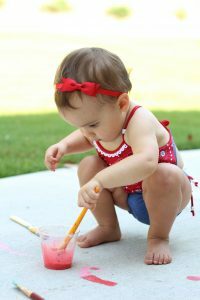 She wants to colors, draw and paint all the time. 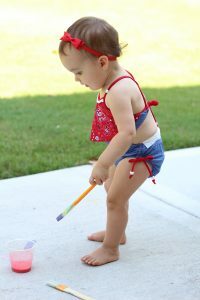 If I let her do art all day, I think she would. With that being said, art can be very messy, especially paint. I’m sharing how I made some chalk paint easy as 1, 2, 3! 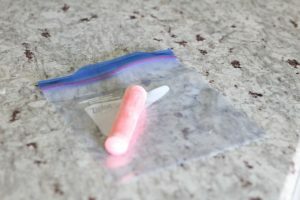 What you need: small cups or bowls, chalk, water, freezer ziplock bags and a wooden or plastic spoon & paint brushes. 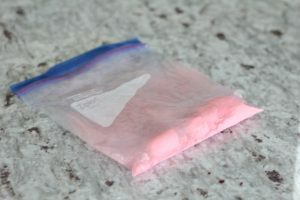 1.First you chose the chalk color you want and put it into the ziplock bag. 2. Second you will hit the bag with a hard wooden or plastic serving spoon. Don’t go crazy and make sure all the air is out or you will bust the bag. Keep hitting until it’s completely broken up. 3. 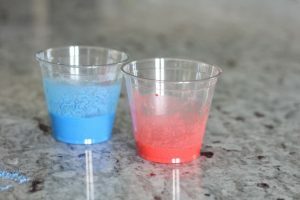 Dump the chalk powder into a cup and add some water. 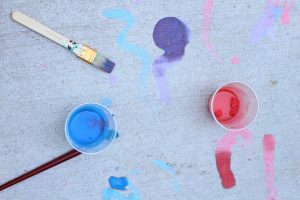 Now take it outside with some brushes and paint away! The Chalk paint dries very quickly on the cement so there is less mess than normal paint. 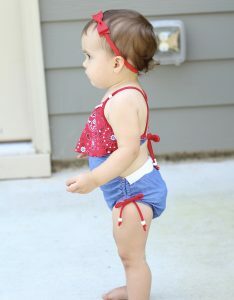 I did put Izzy into a swimsuit so she would be easy to wipe down after. Find colors that are good to mix! I chose blue and red so we could make purple. We also talked about shapes! I painted some onto the cement. I then asked her to find the star and she would go paint the star. It made learning shapes a fun and engaging activity. 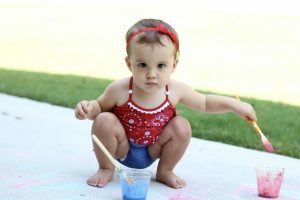 Here’s to a cute babi-kini and less chalk on our hands! 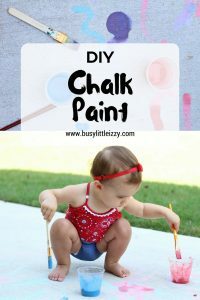 This is an adorable craft idea!! 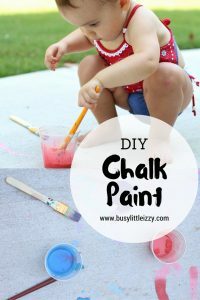 I’m smashing my chalk and taking the kids outside this weekend! …as long as all this rains stops! 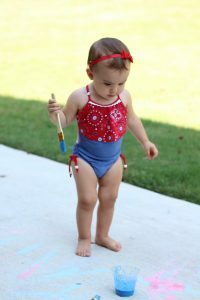 Izzy suit is super adorable too! Thank you! She loved it & so did I! Have fun! Love this idea. We will do it at the cabin this weekend. Oh that’s a great cabin activity! Have fun! That is a genius ide! Love it!